My approach to editing began with creating a stylesheet and cleaning extraneous and unwanted typing mistakes from the document (see The Business of Editing: The AAE Copyediting Roadmap II), moved through tagging the manuscript by typecoding or applying styles (see The Business of Editing: The AAE Copyediting Roadmap III) and inserting bookmarks for callouts and other things I noticed while tagging the manuscript (see The Business of Editing: The AAE Copyediting Roadmap IV), to creating the project- or client-specific Never Spell Word dataset and running the Never Spell Word macro (see The Business of Editing: The AAE Copyediting Roadmap V). The last stop was using wildcards to fix reference formatting problems, running the Journals macro to correct incorrect journal names, and editing the reference list (see The Business of Editing: The AAE Copyediting Roadmap VI). Now it’s time to tackle duplicate references using the Find Duplicate References macro. 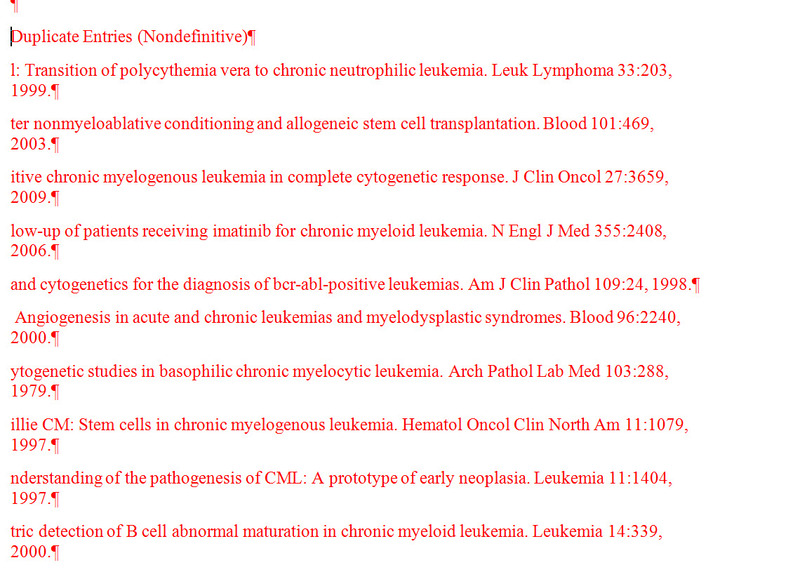 Until recently, finding duplicate references was difficult and very time-consuming. I often deal with reference lists of 300+ references, with many lists running between 500 and 800 references and some running close to 2000 references. 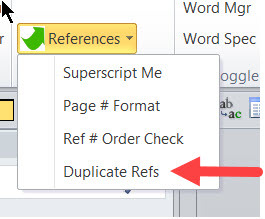 Before I created the Find Duplicate References macro, the only way I had to check for duplicate references in a numbered reference list was to use Word’s Find and do two or three different searches based on the same reference. One search might be on author names, another on article or book title, and a third on the cite information (i.e., journal name, year, volume, and pages). Unfortunately, many authors are sloppy with how they cite references so that the same reference is cited slightly differently each time it is cited. Sometimes a reference is cited completely, other times a reference is missing material. Careful editing of references solved part of the problem, but duplicates of each reference still had to be searched for individually. Time — and profit — flew away. The process was taking too much time and costing me too much profit. 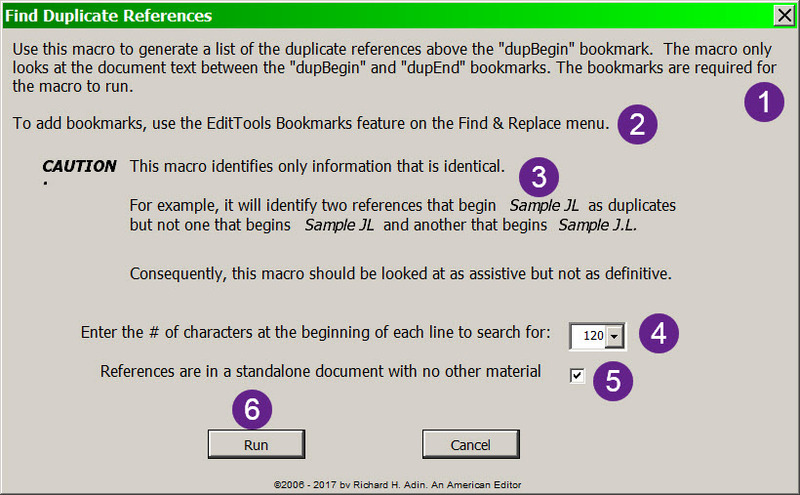 I needed a better solution, which led to EditTools’ Find Duplicate References (FDR) macro, a much quicker and better solution to the problem of finding duplicate references. As good as FDR is at finding duplicates (and from the heavy use I gave it in my last project, which project had more than 21,000 references in total, I know it is very good), it is important to remember that FDR, like other macros, is dumb — it will find only exactly what it is told to find, not something close. If two entries in the reference list are identical except that one has an extra space, FDR might not tag them as possible duplicates because of that extra space. Similarly, if the references are identical except that one uses a colon to separate portions of the article title and the other uses a dash, they will not be tagged as duplicates. Even the dashes have to be identical. For example, a page range that is identical except that one uses a hyphen as a separator and the other an en-dash will result in the cites not being tagged as identical. Again, close only counts in horseshoes. Tip: Because the macro looks for matches within set number of characters, it is occasionally worthwhile to run the macro more the once using a different number of characters as the search parameter. The macro lets you choose 24, 36, 48, 60, 72, 84, 96, 108, or 120 as the number of characters in the search string. Consequently, if you choose 96 characters and two references are identical except that one uses an em-dash and the other uses an en-dash in the article title, the macro will not find them as duplicates. (This is why the macro does two passes — one from the beginning of the reference forward and one from the end backward — in case there is a match from one direction even if not from both directions.) Changing the search string length to 72 might find the duplicates if the dashes appear as the 73rd character or later. Of course, it may still not find the duplicates if the opposing characters still appear within the search string length. The macro is dumb; the characters within the search string must be identical. The dialog that appears when FDR is run, which is shown below (you can make the image, as well as other images in this essay, larger by clicking on the image), provides detailed information about the macro. As I noted previously, it is my habit to move the reference list to its own file. I do this for several reasons: First, the Journals macro runs more quickly because there is less material it needs to check. Second, if the manuscript requires my using Superscript Me (see The Business of Editing: The AAE Copyediting Roadmap VI), it eliminates the possibility that Superscript Me will make unwanted changes to reference cites (e.g., changing 1986;52(14):122 to 1986;5214:122 or 1986;5214:122). Third, it makes it easier to renumber and/or add or delete references during editing of the manuscript (I use three monitors and have found it is easier and quicker to access and edit the references when the text is open on one monitor and the reference list is open on a second monitor). 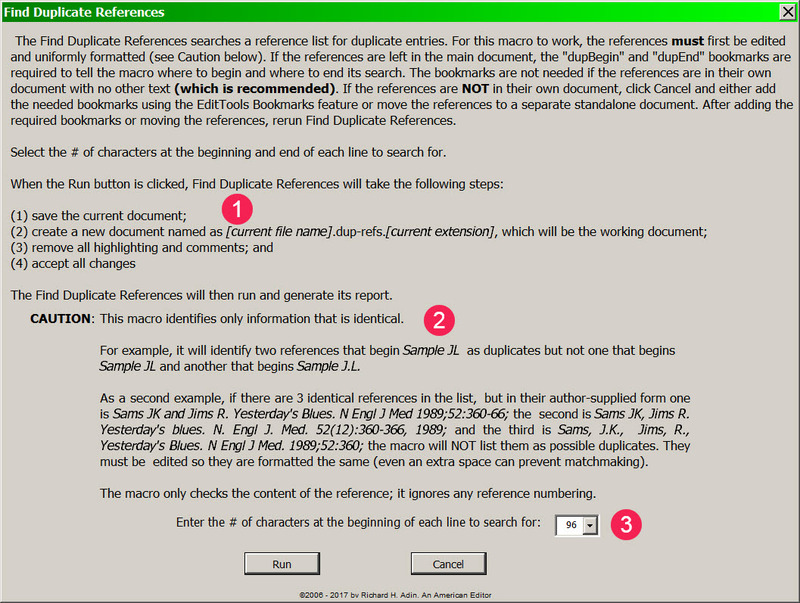 Fourth, the Find Duplicate References macro does several things to the document on which it will run before running, namely, save the current document, create a copy of the current document, remove any highlighting and queries/comments, and accept all changes (see #1 in below image). The idea is that the duplicates will be found in the copy document but the editor will note them in the original document, which is the document that the client will see. The key to the Find Duplicate References macro is remembering that the macro only identifies information that is identical (see #2 in the FDR dialog image above). Consequently, after running the Journals macro and before running FDR, I edit the reference list, making the references consistent. 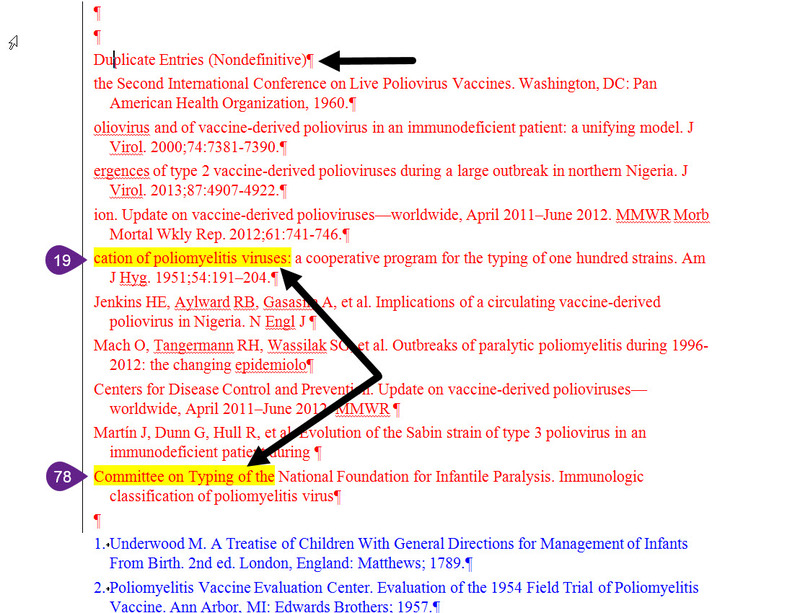 All page ranges, for example, use an en-dash; every time the CDC is named as the author, the name is conformed to “Centers for Disease Control and Prevention (CDC).” In addition, I check URLs and add any missing information. Finally, I tell the macro the number of characters I want it to match (see #3 in the FDR dialog image above; also see the Tip above). Because the macro is a two-pass macro, it will check that number of characters (including spaces) from the beginning of the reference forward (it ignores the reference number and begins the count from the first alphanumeric character that is part of the cite itself) and then from the end of the reference backward. 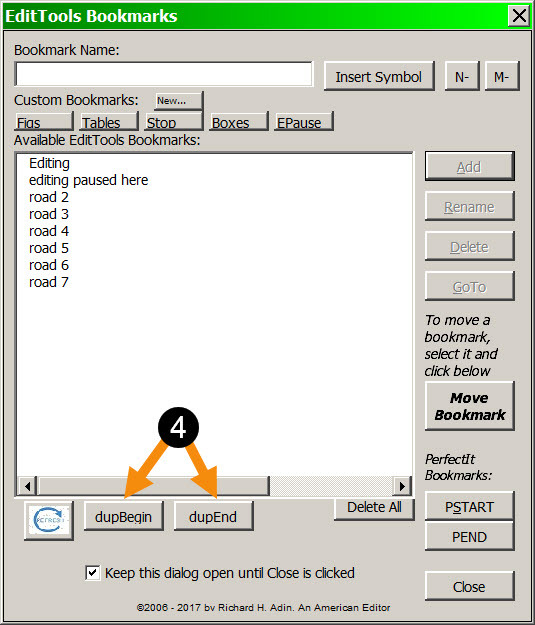 The bookmarks act as a check, as well as make it easier to deal with the duplicate references. When, for example, during editing of the text I come to the callout for reference 18, I can see — from the comment and the bookmarks — that three other references are identical to 18, namely references 72, 91, and 102. Should the author have numbered references out of order and called out reference 91 before 18, I can see at a glance which references are duplicates. 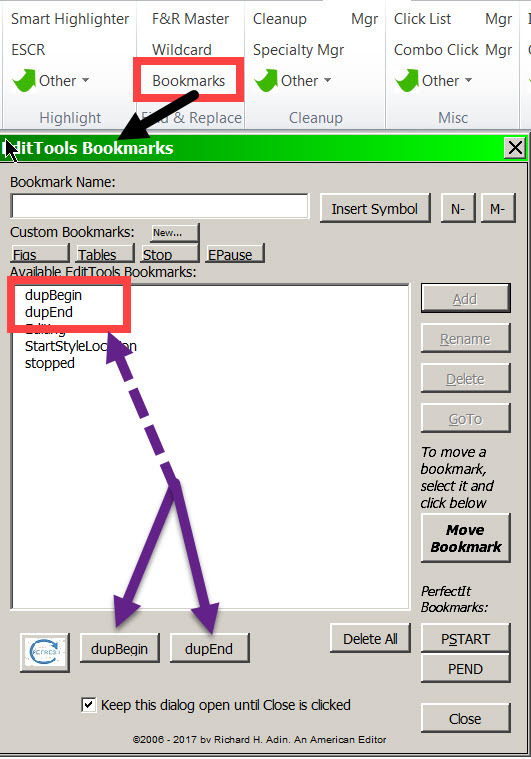 The bookmarks let me easily navigate to each of the duplicate references; once I have deleted a duplicate reference, I can delete its bookmark. 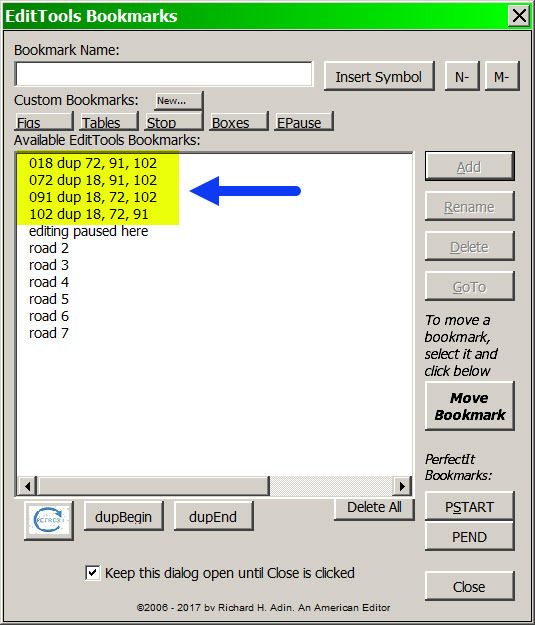 The bookmarks provide an easy way to track which duplicates remain. As the sample report shows, references 78 (#5) and 201 (#6) were deleted and all callouts numbered 78 were renumbered as 19 and all callouts numbered 201 were renumbered as 85. Find Duplicate References works very well. In one chapter I edited in a recent project, the macro found 23 duplicate references in a 700-entry reference list (one reference was duplicated five times!). It took the macro seconds to find those duplicates; had I looked for them without using FDR, it would have added hours to the project and turned the project into a profit-loser. The current version of EditTools is nearly 1 year old. Over the past months, a lot of work has gone into improvements to existing functions and in creating new functions. Shortly, a new version of EditTools will be released (it will be a free upgrade for registered users). The macro works with both unnumbered and numbered reference lists (works better when the numbers are not autonumbers, but it does work with autonumbered lists). It also works with the reference list left in the manuscript with the text paragraphs and when the reference list has been moved temporarily to its own file (it works, like other reference-specific macros in EditTools, better when the references are moved to a separate, references-only file). As the image shows, although references 19 and 78 are identical references and are likely to appear identical to an editor, they will not appear identical to the Find Duplicate References macro. Items 1 and 2 show a slight difference in the author name (19: “Infant”, 78: “Infantile”). The journal names are different in that in 19 the abbreviated name is used (#3) whereas in 78 the name is spelled out (#4). Finally, as #5 and #6 show, there are a couple of differences in the cite information, namely, the order, the use of a hyphen or en-dash to indicate range, and the final page number. If you compare the same items (1 and 2, 3 and 4, 5 and 6) in the above image, you will see that they now better match. (Ignore the inserted comments for now; they are discussed below.) One more step is required before the Find Duplicate References macro can be run — you need to accept all of the changes that were made. Remember that in Word, when changes are made with Tracking on, the material marked as deleted is not yet deleted; consequently, when the macro is run, the Tracked items will interfere (as will any comments, which also need to be deleted). The best method is to (1) save the tracked version, (2) accept all the changes, (3) use EditTools’ Comment Editor to delete any comments, and (4) save this clean version to run the Find Duplicate References macro. When the Find Duplicate References macro is run, the following message box appears. The Find Duplicate References macro matches a set number of characters, including spaces. 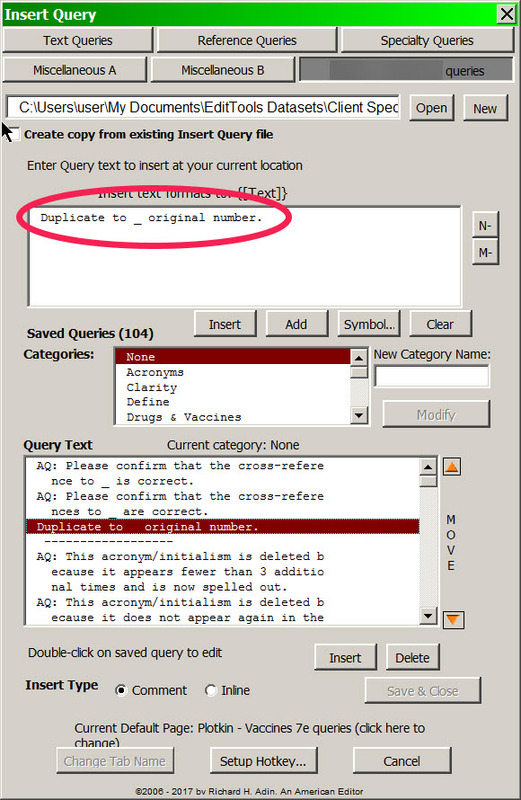 The default is 120 (#4) but you can change the number to 36, 48, 60, 72, 84, 96, or 108 using the dropdown arrow shown at #4 in the Find Duplicate References message box above. The macro does a two-pass search, one from the beginning of the reference and another from the end of the reference, which is why a list of duplicates may have repetitions. (They appear as tracked changes only if the macro is run with Tracking on; if Tracking is off, the results appear as normal text.) Note the title of the duplicates is “Duplicate Entries (Nondefinitive).” The reason for “Nondefinitive” is to remind you that the macro is “dumb” and there is no guarantee that the list includes all duplicates or that all listed items are duplicated. Much of the macro’s accuracy depends on the consistency of editing, including formatting. For the examples in this essay, the Find Duplicate References macro was run on a list of 735 references and the list of possibilities shown represents those likely duplicate references the macro found. 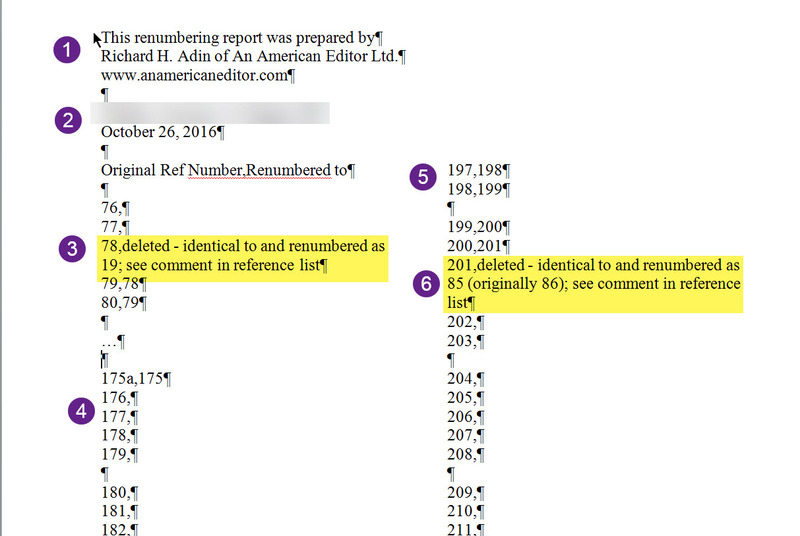 Note that references 19 and 78 were found (#19 and #78 indicate the portions of those references found duplicated by each pass of the macro); however, if, for example, in editing the page range separator in #19 was left as an en-dash in reference 19 and in reference 78 as a hyphen, the macro would not have listed the material at #19 as there would not have been a match. Similarly, if the author name in reference 19 had been left as “Infant” and in reference 78 as “Infantile”, the macro would not have listed the material at #78 as there would not have been a match. When I find a duplicate, I insert a prewritten, standardized comment (using EditTools’ Insert Query) to tell the client that references x and y are duplicates and that I am deleting one and renumbering it (see image below for a sample comment). I insert the comment at each of the duplicate references, although I slightly modify the comment so that it is appropriate for the reference to which it is being attached. The comment shown below is inserted at reference 78 and its language is appropriate for that reference. It tells the client that references 19 and 78 are identical and that reference 78 has been deleted and renumbered as 19. This type of comment is added to the version (e.g., the Track Changes version) of the reference list that will be given the client. The comment is added to the appropriate references as duplication is confirmed. Every report bears the creator’s identification information (#1) and file title (#2). You set the creator information once and it remains the same for every report until you change it using a manager. The file title is set each time you create a report. 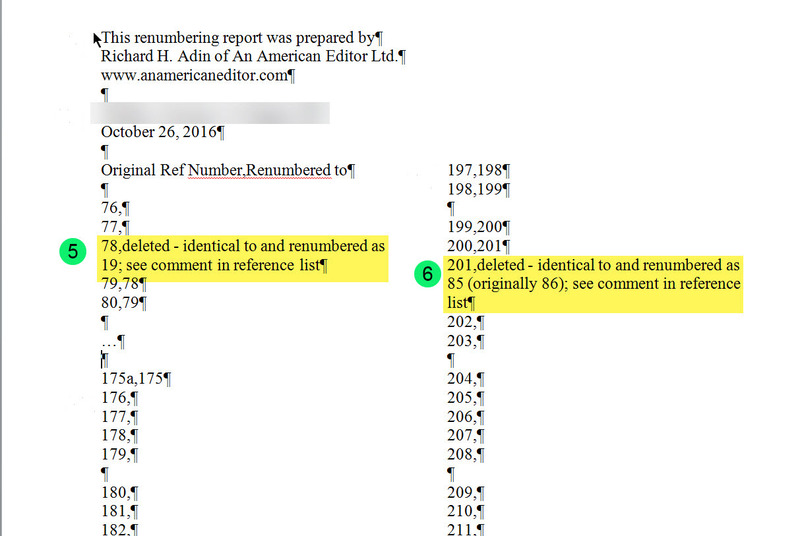 As the report shows, reference 78 was deleted and all callouts numbered 78 were renumbered as 19 (#3). The prewritten, standard message (a new feature) can be inserted with a mouse click; only the numbers need to be inserted or modified. The report shows that the renumbering stopped at callout 176 (#4) and started again at 197 (#5). Number 6 shows another deletion and renumbering. Clients like these reports because it makes it easy for authors, proofreaders, and others involved in the production process to track what was done. The Find Duplicate References macro is a handy addition to EditTools. While it is easy in very short reference lists to check for duplicate references, as the number of references grows, checking for duplicates becomes increasingly difficult and time-consuming. The Find Duplicate References macro saves a lot of time, thereby increasing an editor’s profits.